Our rankings reinforce our deep commitment to innovating the private cloud and spearheading the charge for robust cybersecurity services to meet the shifting demands facing today’s investment industry. 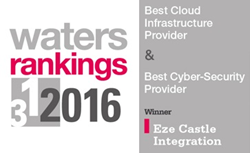 Eze Castle Integration, Inc., a leading provider of strategic IT solutions and private cloud services to the investment industry, today announced it has won Best Cloud Infrastructure Provider for Eze Private Cloud and Best Cyber-Security Provider for Eze Active Threat Protection (Eze ATP) in the 2016 Waters Rankings. This is the third consecutive year that Eze Castle has been recognized in the Waters Rankings, which is a reader’s choice award program. Eze Castle also received the Award for Innovation in Hedge Fund Technology in the 2016 Alternative Investment Awards, presented by Wealth & Finance magazine. This award reflects the company’s unfailing commitment to developing novel technology and client-centric approach. Product excellence and client service are the foundation for Eze Castle Integration’s award winning streak. Eze Private Cloud has emerged as the industry’s preferred cloud platform based on its highly resilient infrastructure, integrated layers of security, built-in disaster recovery and 24x7x365 support. With cybersecurity in the spotlight, Eze Active Threat Protection delivers real-time intrusion protection, 24x7x365 monitoring and expert incident resolution. “On behalf of the Eze Castle Integration team, we are honored to receive these prestigious awards. Our rankings reinforce our deep commitment to innovating the private cloud and spearheading the charge for robust cybersecurity services to meet the shifting demands facing today’s investment industry," said Bob Guilbert, managing director of Eze Castle Integration. “These accolades are a direct reflection of our dedicated staff and their constant drive to provide forward-thinking solutions and best-in-class customer service to our global client base." Waters Rankings experienced a record number of entries in this year’s awards program. Category winners are determined exclusively by WatersTechnology readers, specifically, asset managers, hedge funds, brokerages, prop-trading firms, pension and mutual funds. Eze Castle Integration is the leading provider of IT solutions and private cloud services to more than 650 alternative investment firms worldwide, including more than 100 firms with $1 billion or more in assets under management. The company’s products and services include Private Cloud Services, Cyber Security Services, Technology Consulting, Outsourced IT Support, Project & Technology Management, Voice over IP, Business Continuity Planning and Disaster Recovery. Eze Castle Integration is headquartered in Boston and has offices in Chicago, Dallas, Hong Kong, London, Los Angeles, Minneapolis, New York, San Francisco, Singapore and Stamford.